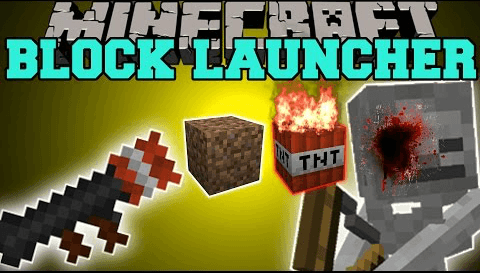 Block Launcher Mod is an interesting mod, I make sure that. This mod will end up your problem with running out of ammo, as you can now shoot blocks from your inventory. In addition, blocks deal with damage depending on how hard it is, and gives serious knockback. It has high rate of fire, can shoot weaker blocks such as dirt or cobblestone. It can kill most mobs with one shot, but needs more heavy blocks, obsidian, or stone at least. It shoots multiple blocks at once, deals high damage at close range. It automatically triggers TNT when used. It fires faster projectile, which explodes instantly after impact, but explosion is smaller. Every weapon can be made by sticky and by adding 4 slimeballs to them. Universality – Allows to shot heavier/lighter blocks, and slightly increases fire rate. Hellfire – flames burn blocks at insanely fast speed, causes bigger damage to enemies.